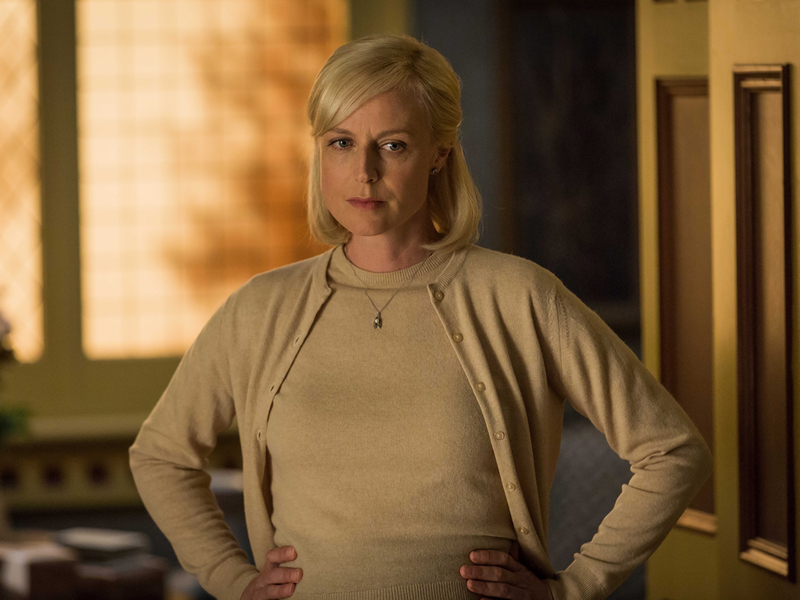 With her powerful performances in three popular Australian series, Marta Dusseldorp can claim three spots on anyone’s list of strong female TV characters. As the title character in “Janet King,” Dusseldorp is a take-no-prisoners prosecutor, a lesbian and a mother. Opposite Guy Pearce in “Jack Irish,” she plays Linda Hillier, a journalist who doesn’t back down from a story. She gives perhaps her most nuanced performance in “A Place to Call Home,” a 1950s period story set in rural Australia. Created by Bevan Lee, it has everything viewers could want in a melodrama, from scandals and betrayals to murder and cover-ups. More importantly, it tackles complex social issues including racism, xenophohia, anti-Semitism, homophobia and class warfare. Dusseldorp plays Sarah Adams Nordmann, a nurse with an epic past. She fought with the Resistance in Europe during World War II and the Nazis imprisoned her in the Ravensbruck concentration camp. As an Australian Catholic who converted to Judaism when she married, Sarah faces damaging gossip and outright hostility when she returns home. She also butts heads with the matriarch of the wealthy Bligh family—and falls for eldest son George (Brett Climo). U.S. audiences can watch all three shows at Acorn TV, the streaming service that will debut Season 4 of “A Place to Call Home” on Nov. 25. In the new season, Dusseldorp teases, the Red Scare sweeps across Australia and George’s wife, Regina (Jenni Baird), accuses Sarah of being a communist and murderer. You currently star in three shows on Acorn playing strong female characters? Is that a must for you when choosing a role? Well, it’s always preferable, I have to say. I find them more complicated and they’re usually involved in their own professions. I love diving into Linda because she’s a journalist. Sarah’s a nurse and Janet is a prosecutor or a commissioner. So I get the entrance into these incredible worlds and I meet these wonderful mentors that I spend time with and shadow quite extensively. I’ve learned a lot about those three disciplines. I think their strength comes from the fact they don’t define themselves in relation to men. They just get on with what they’re doing. They love men and they have difficulties with them, but it’s not because of them or instead or them, or in spite of [them]. I enjoy that. Sarah lives in the 1950s and Janet in the present. How do you compare the role of women from those two perspectives? What do you find interesting about their differences? I think the main difference is that in the 50s, their voice is very different; they speak a lot less and yet they have so much more to say. I really love that sparse, incredibly nuanced dialogue that Bevan Lee and the other writers create in “A Place To Call Home.” It’s very direct. You can’t text anyone, so to find them you have to turn up, which I love, too. I love the journey of getting to the place you need to be, so entrances and exits become incredibly important because you’ve either walked there, so you’re out of breath, or you’ve ridden there, or something like that. There’s more of the outdoors in “A Place to Call Home” as well, so when you actually perform, the environment informs you. Whereas with “Janet [King]”—it’s not worse or better, just different—there’s a lot of talk. It’s not extraneous talk—usually Janet cuts to the point quite quickly and severely. I also love her inability to monitor any kind of nicety. She just wants to get it done and wants it to be right, and that’s because she is working toward saving someone’s life, or putting someone in jail, or understanding a crime, or finding the bad guy. It has a much faster pace to it. I’m about to shoot Season 3 of “Janet King,” so after all the work I do I go up to my room and I’m just running these lines and I realize the pacing has to be “West Wing” style, completely. That you know it like it’s just part of your psyche. Those two differences are really challenging and keep each season for me a satisfying experience, because it’s quite difficult some times. Was it initially jarring to play Sarah after Janet because of the era differences, the role of the women and how they react or interact in society? No, I relished it. I relished not answering questions when I was asked. I loved the mystery of Sarah and she didn’t need to communicate to the world what she had been through. She is a carer, first and foremost. I loved being that and exploring that sort of non-narcissistic behavior, because the world has become more and more narcissistic as we take photos of ourselves constantly and share every moment of our lives. I think “A Place to Call Home” is a great way to step away from all of that and actually just pontificate and reflect. It seems to be deeply immersive for the audiences, at least those that I speak to. They get lost, which I think is really great. They’re not looking for their phone while the show is on. They sit down sometimes with three generations of people, and I think that’s how it felt shooting it. I could feel my grandmother. I could smell her Anzac biscuits, which are biscuits that were made during the war when all they had were oats and lard. It brings up a time for me that I still remember—my grandmother hand-wringing the washing through those metal tubes. My grandma did that, too. At least I’ve seen photos. Yeah, cause they didn’t have electricity. In a way, I pine for that space. So when I put the costume on, and the hair is done, and I walk in wearing my very flat shoes that are unbelievably comfortable—I say this is a world I could spend some time in. So I feel really lucky. In Season 4, Regina finds yet another person, Sergeant Taylor, to go after Sarah. Is she every going to get a break from people attacking her? Or tragedy happening to her? But I don’t know. Certainly with Regina, she invites constant attack, and I think in those days that’s what happened. There were people who never got to rest after the war because they were considered to be reds [communists]. You went through it in this country, similarly. The “other” was so repulsive to them and such a threat to society and how it ran that until they were destroyed they couldn’t rest, and that’s what’s happening with Regina. Love. That’s right. But it’s not shared, I think: George loves Sarah much more than Regina. [Laughs.] But that’s my perspective. But it’s not black and white; Sarah and George’s relationship needs to go through several more manifestations before they can find a place. I like that because that is in relation to modern relationships, so that I think the audience watching can relate. You don’t think so? Do you think that will be the finale, the end of the series? So you hope that never happens? Uhhh, I hope not. No. What about Sarah makes her be able to get through all these tragedies? What gives her strength? Sarah doesn’t think of herself as a victim. She chooses to hold her head high and look to the future. And as I said she’s a carer; she focuses on helping other people and enriching the world. Season 3 just kind of ripped me apart with the tragedy she experienced—finding her husband and then losing him again. She is almost destroyed when Rene dies. I think one of my favorite lines was, “I lost him once and I grieved for him, and how do you do that again?” That was really hard to perform. I found that incredibly sad. In Season 4 you start to see someone who is almost breaking under the pressure. I tried to explore her weaker side, so we stop seeing this stoic, unflappable woman. Having said that, she’s pregnant and that really saves her. There is a bit of lightness through Season 4 with Doris and Roy and that is to keep her up. And as the child thrives in her stomach, I’ve then tried to give her that flush that women get. I’ve had two of my own kids, so I use that to sort of rosy her up for the next fall, which I won’t give away. Oh no! Not again. Back to last season, I did not realize that Ben Winspear, who plays Rene, is your husband. How difficult was it doing those scenes? It was impossible, really. The first one took my breath away, But after the first take I got somewhat used to it. I found that he did good dead, Curt. [Laughs.] Way too dead, babe, can you pull that back a bit? It was Bevan Lee’s idea that he play my husband and I think it was a stroke of genius because the connection needed to be so deep and kind of unbroken, if you like. I loved playing with him. And then Brett coming in became newer to me because I don’t know Brett as well [as I know my husband], so it worked really well for me as a performer. You mentioned that you have two children. Sarah’s pregnant this season. In “Janet King,” you have children. Do you use things from your own life in your acting? You have to, yeah. I try not to therapize on screen. I really try to put it through the way they would handle that situation as opposed to how I would like to explore how Marta handles it. I’m not really interested in using acting as a way to delve into my life, I do that in my own time. I like when my characters surprise me how they react to something as opposed to how I might do it, and then I learn actually from them and become, hopefully, a bit of a better person in my own life. The women I play, I feel, have qualities that are better than mine in different ways. Marta would be like, “How dare you say that!” So in that respect, [my characters] tell me how to behave a lot of the time. And as I get to know them better and better that becomes truer and truer, actually. Speaking of Janet being a lesbian, how does your approach to a character differ playing gay or straight? Not at all—that was so important to me. The woman who originally wrote “Janet King” is a lesbian. She’s a lawyer and Janet was based on her. A lot of the time I would take out lines that made her fight for that [by bringing up her sexuality unnecessarily]. Instead I said she just is and it’s normal and that’s OK and she loves this woman, what does it matter? The more I show it in just the most natural way, I think, is the better way to represent this, that the fight is not her fight. And that was the feedback I got from the gay and lesbian community, saying thank you for showing her without pointing it out, if you like. In Season 2 she falls desperately in love with someone and I love showing that and being physical with a woman, which needed to happen. So yeah, I think it’s totally normal. Will Season 3 of “Janet King” surprise? We’re re-imagining it. It’s three years later and the kids are older, things have changed. I think what it’s about is really interesting; it’s an international problem. So we’ll reposition it again, that’s really important to us. It’s a bit like “The Wire,” you never quite know what’s coming.